Where’s the scholarly press release highlighting Al Gore’s “longstanding ties to tobacco companies?” Where’s the study announcing that WWF’s tobacco connections extend back to the 1960s? 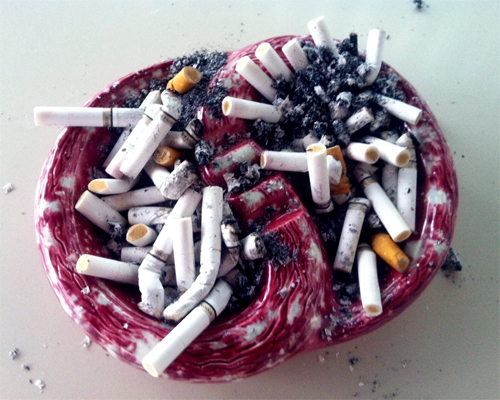 The paper in question has been published in a journal titled Tobacco Control. You can purchase one day of access to it here if you’re willing to pay $30 US (or, since I’m in Canada, the price is 20 British pounds). The author of the paper is a University of California San Francisco professor named Stanton Glantz. Since this is a discussion about who’s connected to whom behind the scenes, it’s worth noticing that Glantz happens to sit on the Editorial Advisory Board of this very journal. In any case, climate activists have a long history of trying to discredit climate skepticism by claiming that skeptics are behaving like Big Tobacco by questioning the urgency of the climate crisis, that we’re employing a “tobacco strategy” to communicate our point-of-view, and so forth. In the comic-book world inhabited by such people, climate skepticism and the Tea Party are practically indistinguishable, hence the interest in this paper. Nonprofit organizations associated with the Tea Party movement have longstanding ties to tobacco companies, and continue to advocate on behalf of the tobacco industry’s anti-tax, anti-regulation agenda. Let’s deal with the last half of that sentence first. The claim is that the Tea Party is promoting the tobacco industry’s agenda. Except that hostility toward excessive taxes and job-killing regulations is actually its own agenda. Those ideas are central to a fiscally conservative economic analysis. Even if tobacco never existed, the Tea Party would still be against red tape. It would still be saying that ordinary people pay too much tax. Any professor who thinks the Tea Party’s opposition to taxes has been orchestrated by the tobacco industry needs to step outside his ivory tower and inhale some fresh air. Which leaves the first part of the sentence. We’re told that Tea Party organizations “have longstanding ties to tobacco companies.” Well, if that is sufficient to discredit the Tea Party, it should be sufficient to discredit a wide swath of environmental activism as well. helped design a $40 million advertising blitz for the big tobacco companies during the Congressional fight over Federal anti-tobacco legislation…[Eskew] is not the only member of the Gore team with tobacco ties. Tina Flournoy, Mr. Gore’s finance director, is a former Philip Morris executive, and Jonathan Tisch, one of his top fund-raisers in New York, is a top executive at the Loews Corporation, the parent company of Lorillard Tobacco. WWF-South Africa was in many ways a special branch of the [WWF]. Instead of appealing to the general public it derived its income from corporate members. Seventy-two companies joined within a year thanks to Anton Rupert’s active canvassing among the South African business community. Calculating that there would always be a great demand for tobacco, regardless of what happened in the world, he developed a cigarette-making company named Voorbrand, soon to be renamed Rembrandt Ltd, whose overseas tobacco interests were eventually consolidated in Rothmans. The WWF is the largest and wealthiest green lobby group on the planet. One of its founders was a tobacco baron. Al Gore won the Nobel Peace Prize for his climate change activism. He has been intimately linked to tobacco for most of his life. Will Professor Glantz be writing a paper about these facts? Will he be declaring, in a press release, that both Al Gore and the WWF have “longstanding ties to tobacco companies”? Will his university issue a press release that announces, in it’s title, that the WWF’s links to the tobacco industry extend back to the 1960s? Finally, will the hired-gun, public relations professionals posing as activists over at DeSmogBlog tweet about how the WWF “was created by Big Tobacco and Billionaires”? This entry was posted on February 11, 2013 by Donna Laframboise in Al Gore, ethical & philosophical, tobacco, World Wildlife Fund and tagged al gore, Anton Rupert, Carter Eskew, DeSmogBlog, Johanthan Tisch, Michael Mann, Stanton Glantz, Tina Flournoy, Tobacco Control (journal), World Wildlife Fund, WWF.